Some of the most critically acclaimed classics are movies about making movies: Sunset Blvd., Singin’ in the Rain, 8½ , Day for Night, The Player, Ed Wood, Boogie Nights, The Artist. There are others, but you get the idea. Personally I adore stories centered on the filmmaking process. Now along comes Saving Mr. Banks, a feature detailing Walt Disney’s quest to bring the cherished children’s book, Mary Poppins to the big screen. I am happy to report it joins the ranks of that illustrious list. I fell in love with the magical English nanny when I first saw Mary Poppins on TV as a youngster. Little did I know that the journey from written text to screen was a tumultuous one, and not the lighthearted affair it appears on screen. 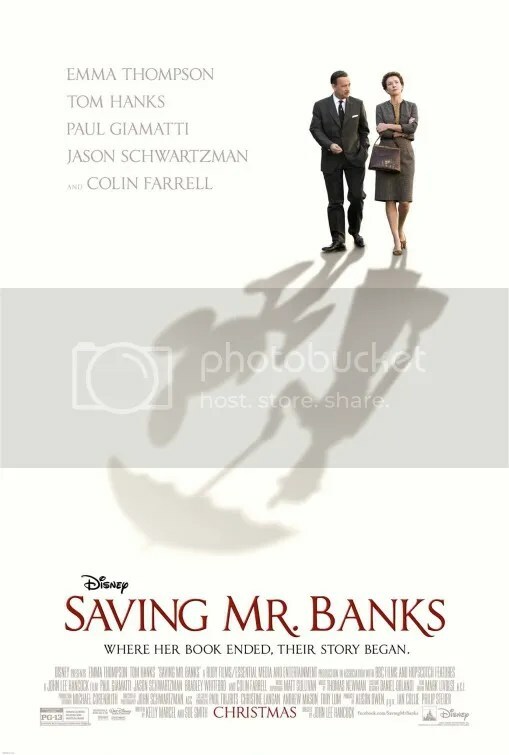 The plot of Saving Mr. Banks concerns Disney’s desire to convince an extremely reluctant author in 1961 to sell him the rights to the story she holds so dear. Before Pamela Lyndon Travers (Emma Thompson) will agree, she demands script approval which necessitates discussions between screenwriter Don DaGradi (Bradley Whitford) and the Sherman Brothers (B.J. Novak & Jason Schwartzman), composers/lyricists for the musical numbers. As head honcho, Walt Disney (Tom Hanks) pops in from time to time to see things run smoothly. The scenes are brilliant in explicating the different sides and what exactly each person wanted. Indeed the back and forth tug of war conversation forms the majority of the plot. If there is a criticism it’s that the narrative could’ve had less depictions of these numerous ongoing fights. Emma Thompson is terrific as P. L. Travers. I think her reverent take of the author is an extraordinary portrait that is award worthy. Yet the script does tend to exaggerate her combativeness for the sake of humor. Everything is up for debate. Before they start, she asks for clarification on the abbreviations for the stage directions. The “Mr. Banks” of the title is the father of the children in the novel. Even something as seemingly simple as his facial hair becomes a bone of contention. She demands a clean shaven father in the movie. “She wants to know why the father has a mustache” his secretary informs Walt. “Because I asked for it” is his reply. Initially I was worried her performance would be one-note, the cantankerous old maid unwilling to budge an inch. She is extremely irritable. Tom Hanks as Disney comes across much more magnanimous. No surprise since Saving Mr. Banks was made by the Disney studio after all. But in flashbacks we see scenes of the author as a young girl in Australia with her loving (but alcoholic) father played by Colin Farrell. These scenes elucidate the inspiration for her novel and why she keeps the tale so close to her heart. Much was based on her own life. Her worry that Disney would sugarcoat a character she meant to be a much darker sort, becomes an understandable anxiety. Irrelevant of the ultimate success of the Disney picture, it was in retrospect quite justified. Saving Mr. Banks is a wonderful film about making a wonderful film. I’ll be honest, despite my fondness for the original flick, I really knew nothing of its background or its author. It’s fascinating to learn is that the process was not a smooth one. The author was not pleased with Walt’s casting choices, the use of animation or the suggestion to turn it into a musical. It’s easy to scoff at P.L. Travers because Mary Poppins the movie is now an acknowledged classic. However the script intelligently presents why Travers resisted the Disneyfication of a beloved story based on her childhood. This is the work of a finely tuned ensemble cast that does an exquisite job at giving life to these parts. Emma Thompson and Tom Hanks are particularly good at presenting 2 individuals at odds. Their insightful vignettes are among the many memorable interactions about the moviemaking process. Even a small role by Paul Giamatti as Travers’ chauffeur accentuates some key scenes. Saving Mr. Banks is a beautiful portrait of how, positive results notwithstanding, the creative process from book to film can be very difficult. This entry was posted on November 11, 2013 at 11:00 pm and is filed under Biography, Comedy, Drama with tags 2013. You can follow any responses to this entry through the RSS 2.0 feed. You can leave a response, or trackback from your own site. Every once in awhile a great poster comes along that doesn’t just advertise the movie, it promotes it with some artistic skill. The Dark Knight Rises teaser poster which showed the bat symbol in the negative space amongst rising buildings was so memorable last year. The Cabin in the Woods Rubik’s Cube was pretty iconic as well. I’m glad you mentioned this. Saving Mr. Banks is one of the better posters I’ve seen this year. And, again, thanks for the recommendation. This one is on my “must-see” list, so I’ll let you know my thoughts once I’ve managed to catch it. FYI: December 13 in limited release and in wide release on December 20. Really? I thought it was being released earlier than that. Guess they’ve started their marketing blitz early. Another one of my most anticipated films and another great review. As a huge Disney fan, I can’t wait to see this and it seems like it’ll not disappoint! I was really anticipating this too. There is a lot of positive buzz surrounding the film. Happy to say I rather enjoyed it. Glad you did. I think I will too. I feel like Saving Mr. Banks is what Hitchcock was to Psycho, except to Mary Poppins. In fact, I was thoroughly reminded of your Hitchcock review. Would it be a correct analysis? Just to throw it out there, I didn’t know this was even out yet–and now that I know what the movie’s about, I LOVE the poster art. Did you say this was an Oscar contender at some point in time? Would this work for somebody who, uh…hasn’t seen Mary Poppins? And his sister, who was bored stiff by the Broadway musical? Was Tom Hanks as good in this as he was in Philadelphia or Captain Phillips? It seems I can’t accept him in any other role (though people seem to recoil when I tell them I haven’t seen Cast Away). I guess there are some similarities, but the movies aren’t that closely related. Saving Mr. Banks and Hitchcock are about different aspects of the creative process. Definitely an Oscar contender. Thompson and Hanks are both possibilities, although I liked Hanks more in Captain Phillips. You don’t have to have seen Mary Poppins, but I think your enjoyment will be greater if you have and love that film. I actually have it on DVD, some anniversary edition. Watched the first ten minutes when I was ten, but got immediately bored. Great review Mark! I love stories centered on the filmmaking process too, sounds like this one is delightful! I haven’t seen Mary Poppins yet but I definitely will try to get to it before the press screening in mid Dec, that’s awesome this is already open where you live! I hope Mary Poppins will enchant you as an adult. It certainly has a magical place in the heart of most kids. Wow. What can I say. This was a great movie. I loved this story about a movie I cherish. Didn’t realize how difficult it was to get this brought to the big screen. It was fun, touching and just a feel good movie. 4 1/2 stars. I know, I just always assumed P. L. Travers was happy with the results. Talk about double jeopardy. First you have your most treasured fictional creation Disneyfied. Fifty years later, when you’re too dead to complain, YOU get Disneyfied. Whatever else it may be, this film’s a lesson in directors’ tricks for letting the audience know who’s got it right and who doesn’t. P. L. Travers can’t even get on an airplane (she does it twice) without the screenwriters making fun of the way she puts a suitcase on the rack; to say nothing of their having Walt follow her to London to psychoanalyze the poor woman in her home. And that ol’ Walt, he’s just so gosh-darn folksy he can’t even bring himself to address Mrs. Travers the way she wants to be addressed. The writers may have succeeded in making it hard for us to sympathize with the author’s efforts to have her concept preserved when it was transferred to the screen, but they’re inadvertently even harder on the man who’d obviously made his mind up in advance what he was going to do and wound up treating the woman who created Mary Poppins as just an obstacle to be got around. The script’s take is lighthearted. It’s not a deep probing biography, but as a presentation of a moment in the creative process I enjoyed it. I grew up loving Mary Poppins too. I had no idea that its production was so tumultuous either until I heard about this film. I’m glad to read that you enjoyed the film and that there some good performances to be found, since I was a little worried about Disney tackling a subject that hits so close to home for them. Definitely some good performances. I suspect Thompson and Hanks will both get nominated. good review Mark. just saw this yesterday.a Wonderful film. i might even give this a perfect star rating. Farrell was an interesting choice for the dad role. But Thompson is terrific like you mentioned. Colin Farrell was an interesting choice as in good? I thought his scenes as the author’s father were a welcome subplot that gave more depth to Emma Thompson’s character as an adult. Farrell has black hair and didnt sound Australian, -more like Irish American i think. Pamela has brown hair and speaks British. So although Farrells performance was good, his screen presence just didnt physically fit as Pamelas father. i know ..this criticism might be a bit too fussy. His appearance didn’t bother me.